Most of The Bachelorette stars from the last 15 seasons reunited this past weekend in order to film Bachelorette Reunion: The Biggest Bachelorette Reunion in Bachelor History Ever!, which is scheduled to air on Monday, May 6 on ABC. While Hannah Brown's season of The Bachelorette is currently filming, famous women from previous editions were photographed on a bus. "The loveliest ladies in television history!!! Can you name them all? #TheBachelorette," franchise executive producer Mike Fleiss captioned a photo of 11 of the reality TV stars Saturday on Twitter. The following ladies are clearly visible in the picture: Trista Sutter from Season 1, DeAnna Pappas from Season 4, Jillian Harris from Season 5, Ali Fedotowsky from Season 6, Ashley Hebert from Season 7, Emily Maynard from Season 8, Desiree Hartsock from Season 9, Andi Dorfman from Season 10, Kaitlyn Bristowe from Season 11, JoJo Fletcher from Season 12, and Becca Kufrin from Season 14. Even Trista's daughter Blakesley, 9, was present in the picture in which all of the women were smiling. Trista, Ashley, Desiree, JoJo and Becca are all still engaged or married to the men who received their final roses. Trista is married to Ryan Sutter, Ashley is married to JP Rosenbaum, Desiree is married to Chris Siegfried, JoJo is engaged to Jordan Rodgers, and Becca is engaged to Garrett Yrigoyen. The former The Bachelorette stars missing from the image were Meredith Phillips from Season 2, Jen Schefft from Season 3, Rachel Lindsay from Season 13, and the current Bachelorette, Hannah. Although some fans worked themselves up into a frenzy over Rachel's absence, she later posed for a different group photo outside of The Bachelor mansion that Fleiss shared on Twitter on Sunday. 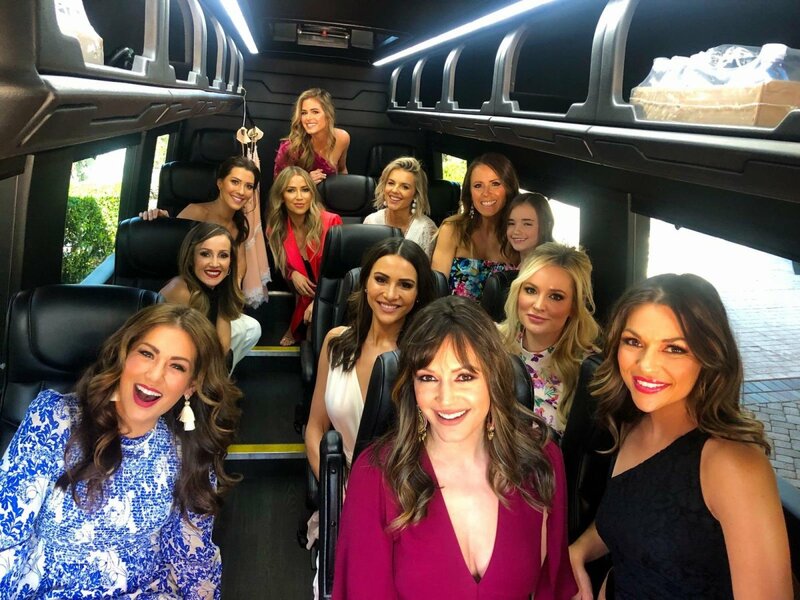 Chris Harrison, who has hosted every season of every The Bachelor show or spin off since the franchise debuted back in 2002, also posted a photo of dozens of fans aboard a tour bus. "All aboard!!! Something incredible coming very soon for you #BachelorNation," Harrison captioned a series of photos on Instagram on Sunday. "It's the mother (mothers in this case) of all #Bachelorette reunions Details soon!" After the reunion special airs, Hannah's edition of The Bachelorette is scheduled to premiere on Monday, May 13 at 8PM ET/PT on ABC.